Arista MVD-102 quad screen multi-viewer displays four video windows simultaneously from four different video sources or computers on a single LCD monitor. MVD-102 is a technology driven solution, ideal for wide range of applications and industries. MVD-102 is a great solution for users with uncertain requirements, for instance applications requiring AV signal from a diverse range of source devices, resolutions and signal formats. 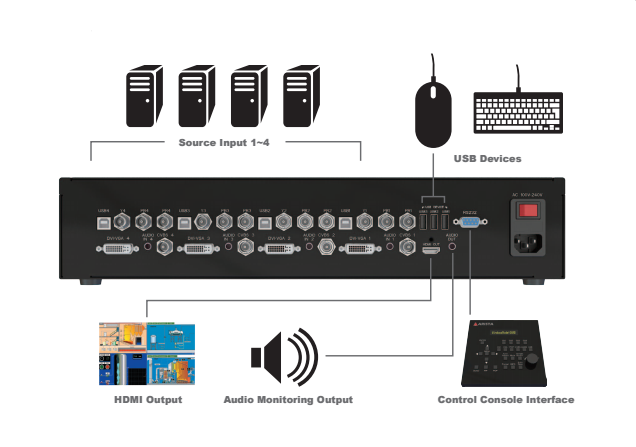 The MVD- 102 quad screen multi-viewer is a great solution for such requirements and provide a rich array of input connections including VGA, CBVS, YPbPr, DVI and HDMI.These supports all popular AV input signal formats. Moreover, the features provide the power and flexibility needed to adapt to the ever-changing demands of media-rich AV environments. Additionally, MVD- 102 can switch one of the four attached computers to a shared keyboard and mouse for operation and to an additional USB device. • Quad, Picture in Picture, Picture on Picture, Full Screen and Dual display modes. • Independent video in to video out resolution. • Accepts analog and digital video signals simultaneously. • Supports digital DVI/HDMI and analog VGA/YPbPr/CVBS video signals. • Built-in 4-port USB switch to switch devices between connected computers. • Compliant with USB 2.0 (high-speed and low/full speed) standards. • Touch screen support – operate connected computers via USB touch screen monitor. 1. Quad Mode – In quad mode, the screen is split into four fields of equal size each displaying the entire contents of four different video sources. 3. Picture in Picture (PIP) -Mode Size, position and selection of the thumbnails are customizable. 4. Dual Mode- In dual mode, the half of the full screen images from two video sources are displayed side by side. The user can use control software to shift both half images. This feature was designed for application that needs to compare specific portion of tow images.